IBM Connect 2016 – Design Thinking Sessions! Posted by Chris Reckling on November 17, 2015 Comments Off on IBM Connect 2016 – Design Thinking Sessions! Want to learn more about IBM Design and design thinking? Read this article in the New York Times. What can you expect to do during these sessions? – Work directly with lead designers, developers, and product managers in defining goals and use cases in different problem spaces. Check out the topics below. – Learn about design thinking by doing it! We’ll use a number of different methods, depending on the session. We can tell you about it for days, but you only learn by doing. These sessions are highly interactive and collaborative in nature. – Design thinking is not just for product development. We’ve done sessions on business models, service design, and even to help managers think about their own practices. – Have fun. Why? Our team is fun! We are experienced facilitators in design thinking and will lead you through the experience. You can find the sessions in the official session preview tool but I pulled them out for you. I am helpful! We know that the need to innovate quickly is pushing people to work differently and collaborate more seamlessly. Influence the design direction for Connections Next by participating in this hands-on design session exploring small team collaboration. Help us understand where and how you work with others most effectively. Plus, be one of the first to give us input on designs for small team collaboration and keeping track of important updates. Learn about design thinking in an interactive presentation – you’ll participate and learn in a hands on way. You’ll learn the basics of Design Thinking and help solve a particular design problem for our application development solution. Engaging beyond the four walls of your business is no longer an aspiration, but is an imperative. Join our design team and share your ideas and needs to help inform our near-term and long-term product roadmap. Did you know you can increase the use of stairs by 66% if you make them look and sound like a giant piano? You can also reduce urinal spillage by 80% by adding an image of a fly in just the right spot. Let’s define the top file- and content-related activities that you would like to encourage in your organization (for example, send file links instead of attachments? )…and then let’s figure out how to make those behaviors irresistibly fun! 1471: Design Thinking: What would it feel like if your Inbox could help you prioritize your Mail? What would it feel like if your Inbox could help you prioritize your Mail? Or if it recommend actions you should take to resolve tasks? If you could ask Verse a question, what would it be? Come explore the future of the Inbox and help us articulate the next evolution in the #NewWaytoWork. 1468: Design Thinking: When did I lose control of my calendar? These sessions will surely be the highlight of Connect 2016. I hope you can make it! Here’s something you may have missed in the little introductory pop-ups when you first log in to the Connections mobile app. We have a new feature, called Favorites, that let’s you, the user, add a link to almost anything in the app to the left navigation. This let’s you quickly get back to a community, file, forum, or person that you frequently open on mobile. Rather than navigate to a list of Communities and then scrolling to the one you want, make it a Favorite. Here’s the trick (yes, we know this is hard for people to find on their own). Go to the thing you want to add, then long press on the blue bar at the top. 2 bubbles will slide out, the one on the left is for copying the link to that item. The one on the right (the star) is to add it to the Favorites list. Here I am in the Renovations Sales Community. And here is the link in my navigation! DONE. You can add just about anything there, so go ahead and try it. To edit, long press in the navigation area at the top and you can reorder or remove items. On Android, the action is in the menus. Hit the menu button and choose Add to Favorites. Here are a couple of screens to give you an idea of what it’s like. It’s a much more immersive experience than we’ve done before and works well in both tablet and phone form factors. Tapping on a picture brings it full screen with a slider at the bottom (or you can swipe left/right to move from picture to picture). Wikis are much easier to navigate now, with the full list of pages available on the first screen and being able to go full screen on the iPad is very helpful in reading the content inside the wiki. Look for an update soon which fixes a few problems on iOS 7. Congrats to the team on the continuous improvement of our mobile apps!! 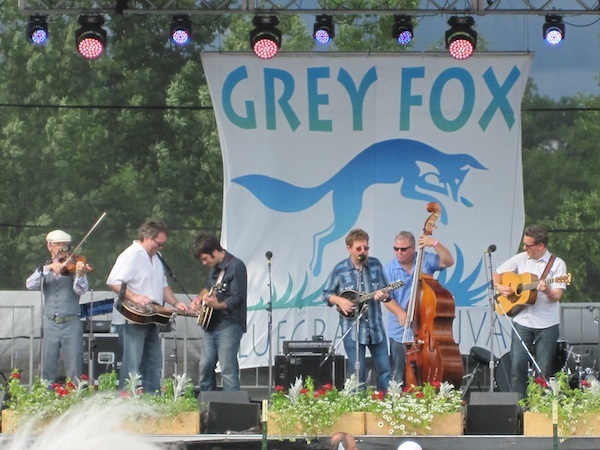 The Grey Fox Bluegrass Festival was on July 17 – 21 this year. This was my second trip there…last year I didn’t post a review until November, which meant I didn’t do a very thorough job of it. This year, the festival occurred during the middle of our Maine vacation, so I got to come back to the beach and relax another week. I headed out on Wednesday, stopping by at the house in Brookline to pick up the camping gear, etc. It was 101 in my driveway, according to the car temperature. And it didn’t get any warmer in Oak Hill, NY either. More on that later. 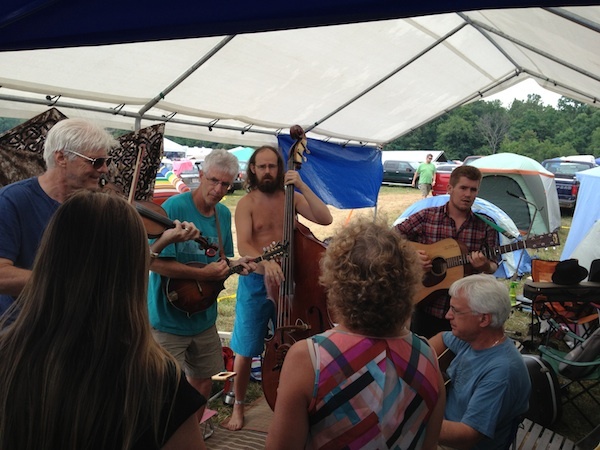 This was my bluegrass pickin’ summer camp for adults (although lots of kids attend, too). Fortunately, I had run into Mike O’Brien at work a week earlier and he offered to save me a spot at their campsite. I think there were about 30 people there from the 3 O’Brien families plus friends, so what’s one more?? It was certainly a big family atmosphere, reminding me of my youth with my cousins, but with music! I felt welcomed right in to the crowd and sweated through setting up my tent while everyone was waiting for the O’Cousins to do their Open Mike set in the dance tent (officially the Catskill Stage, but no one calls it that). The jams happened under the white tent with some spillover to the blue one. 🙂 Thankfully we were along the east side of the farm near the woods, so we were somewhat protected from the sun and heat in the morning, until about 10 anyway. However, on Thursday morning we were jamming (and since I was just learning mandolin, I was using that) and I forgot that my guitar was in the tent until it was too late. It was burning hot in the case and this caused the glue to loosen on the bridge and start to pull up! Aaaargh. 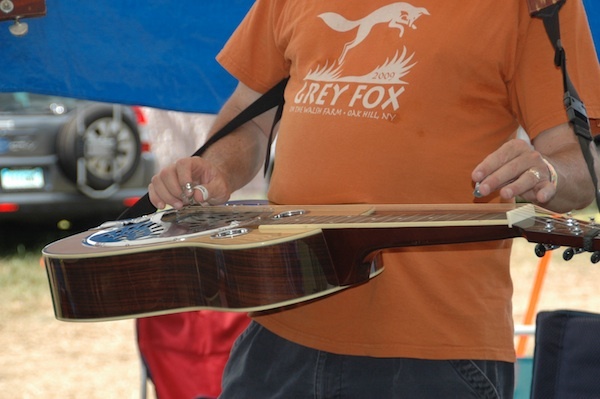 I loosened the strings and opened the case to let it cool down under the tent before playing it again later that night. Every morning started with coffee and a jam session. Someone would just start playing and then others slowly but surely joined in. A most excellent way to start the day. Usually this went on until noon or so. I almost lost a hand playing mandolin, trying to keep up with Joe while he played Roll in My Sweet Baby’s Arms. It was so hot (95 + humidity) that I didn’t really feel like eating anything either, much less walking to the concert stages. Certainly going to the big stage (which is mostly in the sun, although there are some shade awnings up) was not going to be in the cards. I think I lost 2 lbs. every time I went into the porta-potty, too. Every night ended with another session under the tent. At about 10:20 pm the first night (Wed), we got told by the authorities we were too loud since we were officially in the quiet camping area. Boo! Maybe it was the rowdy “Jambalaya”?? A fellow named Brad had drifted over to our campsite to listen and offered up his site, which was just over the line into Pickers Paradise, so we all trudged over there for a bit more hootin’. On Thursday and Friday nights we kept it quieter in our own site, which was challenging. Anyway, the dance tent was louder than us on most nights until about 1 or 2 am, so sue me! On Saturday night, we just played normally and it was fine. A nice O’Brien tradition was to end the night with “Good Night, Irene”. The “Leadbelly version” I was told, which ends with “I’ll get you in my dreams.” None of that wimpy Pete Seeger stuff!! haha. On Saturday night, the O’Briens sang a song for their older brother, Don, who had passed at age 29, that was very moving. Wednesday night. The O’Cousins – O’Brien cousins Flan, Brendan, and Liam did 2 songs at the open mike. People really got into “The Weight” and we played it a few times at the camp site too. I also heard it one night when I was walking around the camp sites. Thursday. Really too hot to do much during the day except sweat. 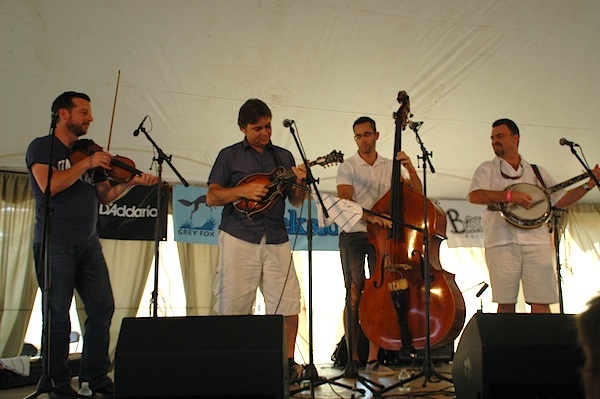 Went up the High Meadow stage for dinner around 6 and listened to Milkdrive, the Deadly Gentlemen, sat at the charging station and listened to Devil Makes Three, then back up to the stage for Keller Williams and the Travelin’ McCourys, which I thoroughly enjoyed. Williams is quirky to say the least. Friday. 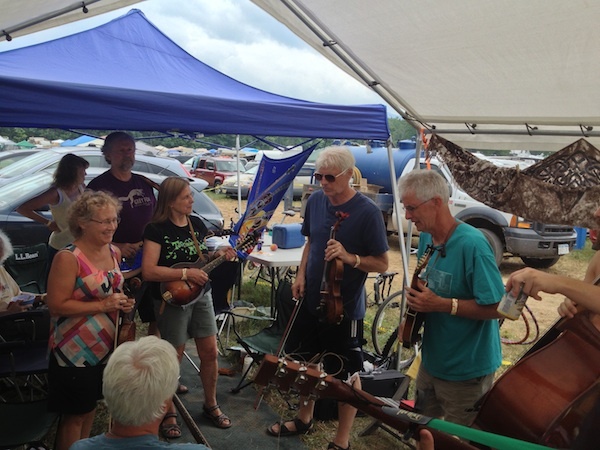 Made it to 23 String Band at 1 pm in the dance tent. These guys were awesome! Check ’em out if they come to your area. One mike to huddle around is always good. I went for food, then came back for the end of I Draw Slow, a great Irish band playing more traditional Americana (I suppose). After that I headed over to the masters tent (a.k.a. Creekside) since it was too hot to be anywhere else. There I saw Nora Jane Struthers and up and coming band, then got a seat right in front for Milkdrive and then the Travelin’ McCourys. In the past, this tent was supposed to be for ‘workshops’ but this year it was more just another, more intimate stage. 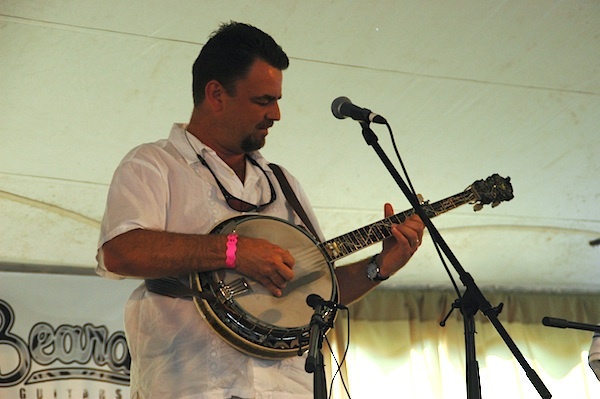 The McCoury’s were the only ones who tried to encourage questions – they got a lot of tune requests but finally someone asked a real question about Rob’s banjo, which he got from his father-in-law. He said he put 4000 hours into it. Ronnie and Rob also answered a question about their kids and their interest in music. I went back to the campsite after this to chill out – not that it was possible in the heat. I actually took a shower in the gravity shower they set up. Let me tell you, that water was hot, too!! I played a little guitar, which is why I also missed Della Mae on the main stage. We had just seen them at Passim’s so I wasn’t too broken up about it. 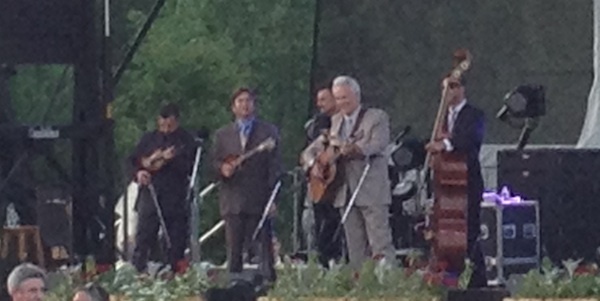 I did make it back for Del McCoury and the Infamous Stringdusters, both fabulous in different ways. Del held down the fort with some classic numbers, such as Vincent Black Lightning and Rain and Snow to close it out. (I swear Ronnie sounds more like him every year, too!!) He was bantering with the crowd and having a good ole time. The Stringdusters just tore up it from beginning to end – fast and faster was the order of the day. Saturday. After the usual morning jam session, I headed to lunch at caught the last part of the Lonely Heartstrings Band. They are one of the bands that Berklee seems to be churning out these days. 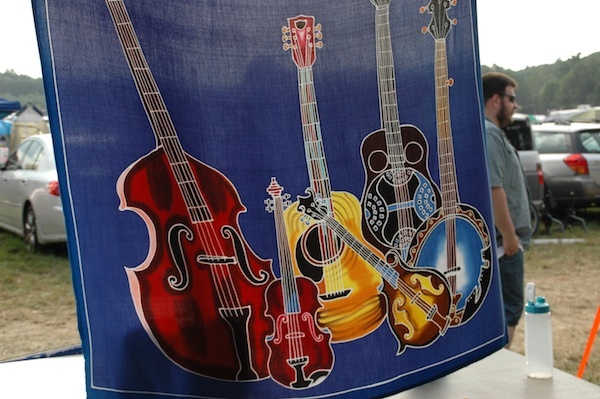 The name comes from them covering Beatles tunes, which they did, but they also did some straight ahead bluegrass. 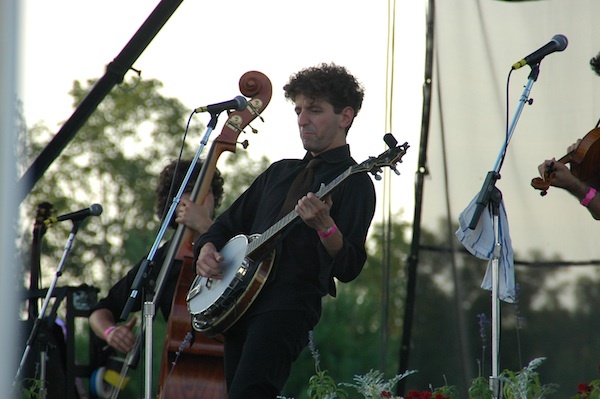 Gabe Hirschfield on banjo is one to look out for. They did a Scruggs classic, which I can’t remember right now, which featured him. The vocals were strong, which is the only way you can get away with Beatles in bluegrass style. It wasn’t as hot as the last 2 days, thankfully. I went back to camp for a while to rest up, then made my way back up the hill to see Tim O’Brien(m) with Bryan Sutton(g), Noam Pikelny(b), Casey Dressen(f), and Mike Bub(bs). 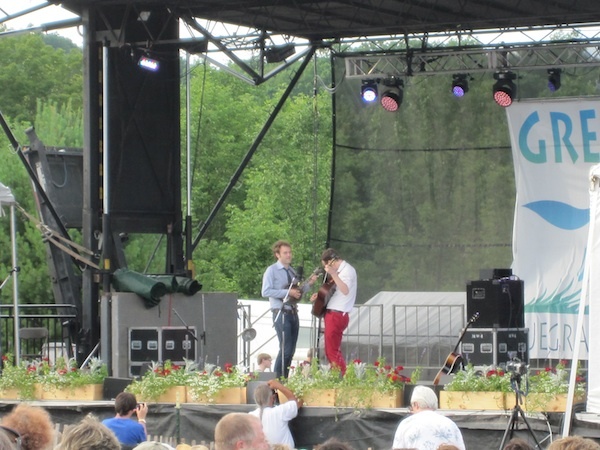 Fairly straight foward set – I even noticed Thile checking them out in the VIP seating. Jerry Douglas hopped on stage for the last 2 numbers. After dinner, it was non-stop music. Up first, Thile/Daves duo began the set with their usual Monroe tune, Evening Prayer Blues. From there they went into the standard repertoire they have done on their album (Rabbit in a Log, Sophronie, Loneliness and Desperation, Sleep with One Eye Open, etc) along with a couple of tunes from Tim Sparks and one they did for a documentary, called Richmond (which tagged on Soldier’s Joy). Fiddle tune request time was Scotland (A), Whiskey Before Breakfast (D), and Big Sciota (G). You can find the video here. Brilliant as always. Next was the Jerry Douglas band, a.k.a. the Earls of Leceister, which does music of Flatt and Scruggs from the 50’s. Unexpected, but refreshing take on it. It seemed like a lot of people left the main stage to go see Rushad Eggleston at the dance tent. Video posted on youtube. I had never seen the Carolina Chocolate Drops before, although I have a couple of their albums. Wow! What a show! Not only musically satisfying but also visually interesting. The crowd went crazy for them, too. Highly recommended. Here they are doing “Jackson“. The Magnificent Late-Night Supersonic All-Stars was anchored by Tim O’Brien and included the base group of Thile, Bales, Douglas, Pikelny, Cushman, Driessen. Dom Flemmons from the Drops came back to hold down the fort on “Mama Don’t ‘low No Music Playing Round Here”. This gave every one a chance to stretch out, including him on harmonica. Thile did the Band version of Cripple Creek. Tim brought out Nora Jane Struthers to do Won’t You Sing with Me and another Hot Rize tune. I Draw Slow made an appearance for 2 songs. Courtney from Della Mae played a duet of I Am a Pilgrim with Bryan Sutton (Bryan mentioned that Tony Rice was not doing well…) Kimber Ludiker and Brittany Haas came out to lead Wheel Hoss. The highlight of the night might have been Rushad leading them on Mississippi Sawyer and I Peed on a Bird – pretty funny. Video here. 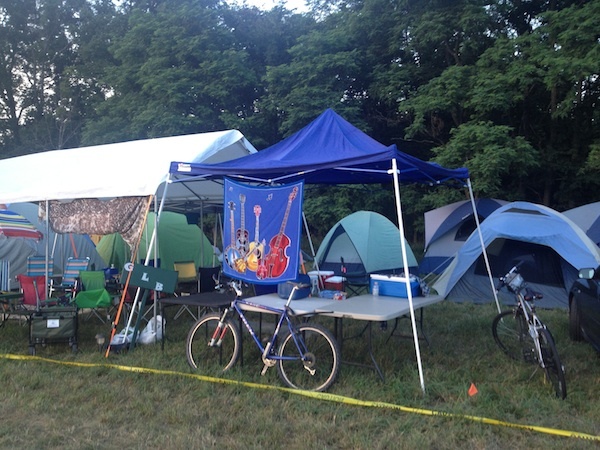 After that, we went back to the camp site for our own late night all star jam until about 3 am. Of course, the fie alarm sirens blasted everyone awake around 5 am!! By 8, it was time to pack up and leave another Grey Fox behind and return to civilization. My first stop was Starbucks on the turnpike, and I listened as I drove, to the audio I had recorded from the various sets I attended. Good stuff and kept me awake. After dumping off the camping gear at home, I headed back to Maine for the rest of the week. 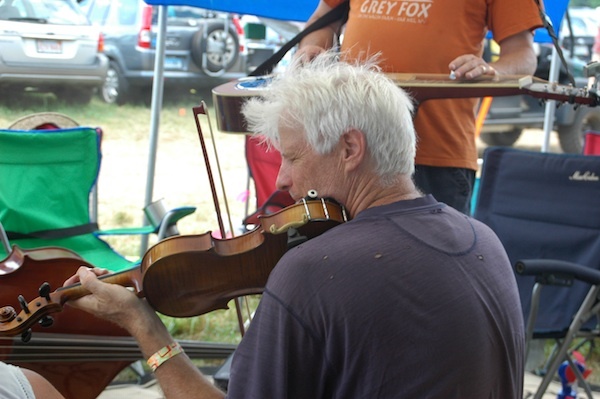 Check out my tumblr for more pics of Grey Fox 2013. The Splinters were feature act at the Roslindale Open Mike on June 10, 2013. That means you get to do about 1/2 hour set or more if they like you. We prepared 6 songs and a couple of more in the wings, just in case and got to all of them for about 40 min. Needless to say, we had a good time and people seemed to enjoy it, singing along to these old chestnuts. Here’s a video I posted to youtube, in which I overlaid the sound from the board, so you can’t hear the crowd singing (awwww). Hope you enjoy it and check out our gig schedule on splintersmusic.com. We kind of have a July vacation break, then 5 gigs in August. Simplified FIles list – there is now a tab at the bottom of the list to switch between Files and Folders. There was a lot of duplication in the drop-down view menu such as “My Files” and “My Folders”. Now it’s just Files and you can switch to Folders view with the tab. Added Profiles About Me and Tags. You can also tag people and manage your tags as well as search from the tag screen. Share and access folders from a Community. Use client certificates to authenticate with your enterprise. Added Action Required view to Updates on iOS. You can also actually take action from there; for example, to accept a network invitation or community invitation. Some dialog boxes for adding new content have been implemented as native controls. For example, in Activity entries, Blog comments, and wiki comments. Many Connections web URLs that previously switched to open a separate web browser to the full site, will now go to the right service in the mobile app. Here are a few screen shots to whet your appetite. Figure 1. Files showing the new view choices, files/folders tab, and details view. Figure 2. New Action Required view on the iPad. Figure 3. These screens show the Android phone version of profile tags and then when you tap a tag, a search is done so you can find other people with the same tag. We hope you enjoy these latest updates! Somerville, MA – May 18, 2013 – J and I signed up for Somerville Porchfest, porch graciously provided by Jennifer Badot. We played from 2-4 pm. At first there were only a handful of people there, but pretty soon bikes, dogs, and roaming gangs of people stopped by. It was a windy day and we were in the shade on the porch, but folks mostly hung out across the street in the sun. Usually we play 2 sets, but when we got to the end of the first one, we didn’t want to stop in case the crowd decided to pick up and leave. So we kept going, calling a few audibles here and there from what we had on the list. I video’d the whole thing from a stationary camera below us and here are a few of them I posted to YouTube. We’re playing out about 2-4 times a month, so check out the web site for more info about when and where. IBM has released updates to the Connections mobile apps for Android and iOS – version 4.1. This one has some additional features and a handful of UI enhancements in it. In addition, there is broader support for SmartCloud Engage, including Communities (FIles, Forums, Bookmarks) and People. As is my custom on this blog, here are a handful of screenshots that show off the new features. 1. You can use @mentions in a status update post. We’ll look up the name locally first, then search the server. It’s fast. 2. In Files, we have gone to this action bar UI on the bottom of details screens, putting the most common actions a tap away. The download action is right there, too, and not hidden like before. (Downloads is also at the top level navigation, making it easier to find than before – you can see it on the iPad screen below. The FIles list itself has a dropdown “action drawer”. The reason we did this is to optimize for the most common use case, which is to actually view the file. Now, tapping on the file will attempt to view it; tap on the dots to show the menu to download or go to the file details. 3. Likes on posts and comments can be done in the post details. 4. Target posts to a person or community. When you choose one of those options, then you can pick which person or community. 5. In the small things make a big difference department, we added a Recently Viewed Communities view to the Community list to make it easier to get back to a community you may have just been working on. We put the buttons here below the tab (also in profiles), and there’s an alert if you accidentally hit the Leave button. 6. Attachments in forums are accessible now on the device. Here you go to More Actions… then choose to View Attachments to get to the next screen. As mentioned in the app store descriptions, there are a bunch of new command urls for you to explore. For example, now you can open a community and navigate to particular app in the community. I will update this blog when the technote is updated with the details on that. The app remembers which view you were using at goes back to it. So, for example, if you always use the “My Communities” view in the Communities section, you will return to that view each time you leave it and go back. The default view for the Activity Stream is “I’m Following”. We thought this would be the more comprehensive view. Of course, you can always change it and we’ll remember that next time. On the iPad, the card panels are easier to close with a single swipe to the right. The community About section has all the rich text rendered and links can be opened within the app.